But the new institution — the Morehouse School of Medicine, in Atlanta, Georgia — denies they ever employed him. 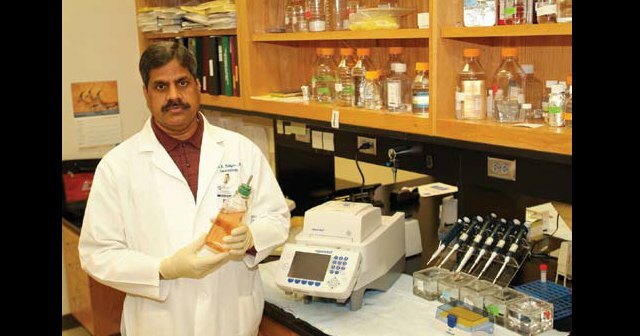 As we reported in May for The Scientist, Santosh Katiyar left his positions at the University of Alabama, Birmingham (UAB), and Birmingham VA Medical Center last year after a four-year investigation concluded he had committed scientific misconduct. Over the course of his career, Katiyar had obtained millions in funding from the U.S. National Institutes of Health — and according to an official NIH record, he continued his research at another institution. As one of our eagle-eyed commenters noticed, according to NIH’s Research Portfolio Online Reporting Tools (REPORTer) database, Katiyar was — for several months — the Project Leader of a nearly $300,000 grant from the National Cancer Institute, affiliated with Morehouse School of Medicine. The NIH says Morehouse asked to transfer the grant from UAB in December 2017, and listed Katiyar as the principal investigator. Although Katiyar’s affiliation is listed as Morehouse School of Medicine on the grant, a spokesperson for Morehouse says he was never employed there. [Katiyar] is not employed with Morehouse School of Medicine and has no affiliation. When we followed up, she confirmed Katiyar had never been employed by the Morehouse School of Medicine. The grant in question had been transferred from Alabama at Birmingham to Morehouse School of Medicine. NIH received a Type 7 Change of Institution application from Morehouse School of Medicine in December, 2017 listing Dr. Santosh Katiyar as the principal investigator, with his affiliation listed as Morehouse. NIH issued a notice of award in December 2017 documenting Dr. Katiyar from Morehouse School of Medicine as the principal investigator. Subsequently, NIH became aware of concerns about the integrity of Dr. Katiyar’s data. NIH contacted Morehouse and Morehouse requested early termination of the grant on March 19, 2018. So, the information in RePORTER reflects the information we had at the time of award. The Notice of Award was revised on 6/19/2018 to reflect a revised budget/project end date of March 19, 2018. Indeed, REPORTer shows the grant was terminated at Morehouse’s request. We’ve emailed and called the Morehouse spokesperson for a response to NIH’s statement, but haven’t heard back. The research community has long struggled with the question of how to handle scientists who commit misconduct then apply for new positions (you can read more in our article at Undark). The Alabama investigation into Katiyar’s work recommended that 20 papers be retracted. He has lost six papers so far. The question is: how much money did Morehouse School of Medicine take from the grant? If it did take any surely it should pay it all back? When will we have people who report false information in support of (or resulting from) federal grant applications face some ACTUAL jeopardy instead of some ridiculous 3-10 year ban? Many of those who are guilty of research misconduct have already earned a lifetime’s income, had grant-paid international travel (vacations?) and many other perks. In the current system, at worst, they just go into retirement. But some poor single mother who gets caught lying about her child(ren)’s father to obtain $55 extra support can go to prison. Where’s the justice?!? I believe there have been some scientists guilty of fraud going to jail. Remember there’s a case in Iowa. Yes, that’s correct. But this happens in only a small minority of cases. Extremely well-put. Unequal justice. People are defrauding tax payers by the tens of millions with impunity. These people need to be jailed. The universities they are affiliated with need to pay back all money with interest, and the universities involved need to have automatic global reduction in taxpayers funding, say 5% per offense.